Our staff at Medifocus is committed to keeping our subscribers to the Medifocus Digest Alert on Acoustic Neuroma abreast of the latest new research developments that have recently been published in the medical literature for this condition. In this issue of the Digest Alert, you will find a focused list of hand-picked journal article references that represent the latest advances in basic and clinical research for Acoustic Neuroma. 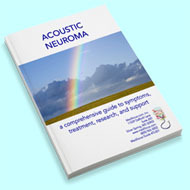 These articles represent the current state-of-the-art of the research that will hopefully lead to additional major advances and breakthroughs in the clinical management of Acoustic Neuroma. You can access the summaries of each article referenced below by simply clicking on the article Title. We will continue to update you with the latest scientific and clinical developments through the Medifocus Digest Alert on Acoustic Neuroma every 3 months. Thank you for your ongoing subscription to this publication. 1: Progression of hearing loss after LINAC-based stereotactic radiotherapy for vestibular schwannoma is associated with cochlear dose, not with pre-treatment hearing level. Institution: Department of Otorhinolaryngology and Head & Neck surgery, Erasmus MC, Postbus 2040, 3000, Rotterdam, CA, Netherlands. a.vanlinge@erasmusmc.nl. Amsterdam, DD, Netherlands. 3000, CA, The Netherlands. 3000, CA, The Netherlands. 3000, CA, The Netherlands. Netherlands. Netherlands. 3000, CA, The Netherlands. Journal: Radiat Oncol. 2018 Dec 24;13(1):253. doi: 10.1186/s13014-018-1202-z. 2: Management of Vestibular Schwannoma (Including NF2): Facial Nerve Considerations. Institution: Department of Otolaryngology-Head and Neck Surgery, Icahn School of Medicine at Mount Sinai, New York Eye and Ear of Mount Sinai, Floor 6, 310 East 14th Street, New York, NY 10003, USA. Electronic address: Maura.Cosetti@mountsinai.org. Journal: Otolaryngol Clin North Am. 2018 Dec;51(6):1193-1212. doi: 10.1016/j.otc.2018.07.015. 3: Evaluation of Vertical Semicircular Canal Function in Patients With Vestibular Schwannoma. Institution: 1 Department of Otolaryngology-Head & Neck Surgery, Faculty of Medicine and Graduate School of Medicine, Hokkaido University, Sapporo, Japan. Journal: Ann Otol Rhinol Laryngol. 2019 Feb;128(2):113-120. doi: 10.1177/0003489418808545. Epub 2018 Oct 26. 4: Impact of Motor-Evoked Potential Monitoring on Facial Nerve Outcomes after Vestibular Schwannoma Resection. Institution: 1 Division of Otolaryngology - Head and Neck Surgery, Department of Surgery, University of California, San Diego School of Medicine, San Diego, CA, USA. College of Medicine, Cincinnati, OH, USA. College of Medicine, Cincinnati, OH, USA. College of Medicine, Cincinnati, OH, USA. Cincinnati, OH, USA. College of Medicine, Cincinnati, OH, USA. Journal: Ann Otol Rhinol Laryngol. 2019 Jan;128(1):56-61. doi: 10.1177/0003489418803969. Epub 2018 Oct 20. 5: Challenging Anterior Inferior Cerebellar Artery in Retrosigmoid Vestibular Schwannoma Removal. Institution: Department of Neurosurgery, Seikei-kai Chiba Medical Center, Chiba, Japan; Department of Neurosurgery, Chiba Central Medical Center, Chiba, Japan. Electronic address: yamakami@seikeikai-cmc.jp. Chiba, Japan. Journal: World Neurosurg. 2019 Jan;121:e370-e378. doi: 10.1016/j.wneu.2018.09.111. Epub 2018 Sep 25. 6: MIB Index as Predictor of Recurrence in Sporadic Vestibular Schwannomas. Institution: Department of Neurosurgery, Krishna Institute of Medical Sciences, Secunderabad, Telangana, India. Electronic address: manasp1966@gmail.com. Telangana, India. Telangana, India. Telangana, India. Journal: World Neurosurg. 2018 Dec;120:e1203-e1207. doi: 10.1016/j.wneu.2018.09.039. Epub 2018 Sep 18. 7: The prediction of the tumor size of a vestibular schwannoma by clinical performance and vestibular function tests. Institution: Department of Otology and Skull Base Surgery, Eye Ear Nose & Throat Hospital, Fudan University, Shanghai, People's Republic of China. People's Republic of China. Fudan University, Shanghai, People's Republic of China. People's Republic of China. Fudan University, Shanghai, People's Republic of China. People's Republic of China. Fudan University, Shanghai, People's Republic of China. People's Republic of China. Fudan University, Shanghai, People's Republic of China. yuanyasheng@163.com. People's Republic of China. yuanyasheng@163.com. Journal: J Neurooncol. 2018 Dec;140(3):679-686. doi: 10.1007/s11060-018-2998-y. Epub 2018 Sep 20. 8: Impact of cochlear implantation on the management strategy of patients with neurofibromatosis type 2. Institution: Department of Otolaryngology Head and Neck Surgery, Shanghai Ninth People's Hospital, School of Medicine, Shanghai Jiaotong University, No 639 Zhizaoju Road, Shanghai, 200011, China. huan_jia_orl@163.com. ; Ear Institute, Shanghai Jiaotong University School of Medicine, Shanghai, China. huan_jia_orl@163.com. ; Shanghai Key Laboratory of Translational Medicine on Ear and Nose Diseases, Shanghai, China. huan_jia_orl@163.com. ; Department of Otolaryngology Head and Neck Surgery, Shanghai Ninth People's Hospital, School of Medicine, Shanghai Jiaotong University, No 639 Zhizaoju Road, Shanghai, 200011, China. wzyent@163.com. ; Ear Institute, Shanghai Jiaotong University School of Medicine, Shanghai, China. wzyent@163.com. Journal: Eur Arch Otorhinolaryngol. 2018 Nov;275(11):2667-2674. doi: 10.1007/s00405-018-5127-9. Epub 2018 Sep 18. 9: Role of Endoscopy in Resection of Intracanalicular Vestibular Schwannoma via Middle Fossa Approach: Technical Nuances. Institution: Department of Neurological Surgery, The Ohio State University Wexner Medical Center, Columbus, Ohio, USA; Department of Neurological Surgery, Ain Shams University, Cairo, Egypt. Center, Columbus, Ohio, USA. Wexner Medical Center, Columbus, Ohio, USA. Wexner Medical Center, Columbus, Ohio, USA. Center, Columbus, Ohio, USA; Department of Otolaryngology-Head and Neck Surgery, The Ohio State University Wexner Medical Center, Columbus, Ohio, USA. Electronic address: dprevedello@gmail.com. Journal: World Neurosurg. 2018 Dec;120:395-399. doi: 10.1016/j.wneu.2018.08.215. Epub 2018 Sep 7. 10: Local experience with radiosurgery for vestibular schwannomas and recommendations for management. Institution: Department of Radiation Oncology, National Cancer Centre Singapore, Singapore. Journal: Singapore Med J. 2018 Nov;59(11):590-596. doi: 10.11622/smedj.2018107. Epub 2018 Sep 5. 11: Different clinical presentation of intralabyrinthine schwannomas - a systematic review. Institution: Universidade Federal de Sao Paulo (UNIFESP), Departamento de Otorrinolaringologia e Cirurgia de Cabeca e Pescoco, Sao Paulo, SP, Brazil. Electronic address: mantunes@uol.com.br. Journal: Braz J Otorhinolaryngol. 2019 Jan - Feb;85(1):111-120. doi: 10.1016/j.bjorl.2018.05.007. Epub 2018 Jun 21.